Compu 2048FC was developed to be the simplest solution to operating your lighting effects. With other lighting consoles you have an array of faders, buttons and knobs to work with � remembering what they all do can get tricky. The advantage with a PC based system is the ability to see everything right in front of you. Compu 2048FC features include: a vivid display of scenes and shows; the ability to name and rename all of your cues; plus have direct access to your colors and gobos. 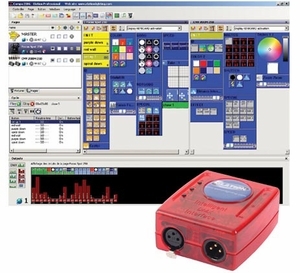 Compu 2048FC has all the features for the professional lighting programmer but developed with the novice in mind, taking away fears and doubts about programming lighting. � Unlimited number of Scenes! � Fixtures only limited to channels used. For Compu Live Support, please call 866-245-6726 extension 548. For use with windows XP or ME only. For Windows 98 or 2000, you must use Compu 02 edition.